If you’re a small business, you have a noise problem. There are so many ads out there that your potential customers just block them all out. This means that most marketing campaigns are just a visual form of white noise that people instinctively ignore. So your have to find a way to stand out and seize the attention of a jaded audience. Unconventional marketing is not a choice; you have to be different if you want to beat your competitors. Larger corporations have massive advertising budgets that allow them to flood the media and Internet. You don’t have that luxury, but you do have another advantage. You may have a smaller target customer base, but you also have a closer connection to them. You know what your customers want and what is important to them. That knowledge is something larger corporation spend thousands of dollars trying to get. Your familiarity with your community must be the basis of any marketing push you do. The purpose of an unconventional marketing strategy is to seize the attention of your potential customers through surprise. But if your campaign annoys instead of pleasantly surprises, it will drive potential customers away. That’s why using your knowledge of your community is so vital when building your campaign. Another thing you should avoid is letting the ad overwhelm your brand. It’s really easy to come up with a memorable ad, execute it well, and then have customers remember the ad but not the company that created it. Advertising works best when there’s a clear connection between the content of the ad and the product you’re trying to sell. This way, the content of the ad increases your brand’s value. With those warnings in mind, you should know that there are no standard unconventional marketing strategies; if something is standard, it’s not unconventional. But there are some strategies that are a good starting point toward building an unconventional marketing plan. For example, take advantage of local landmarks. Local landmarks are a great place to advertise because people see them every day. One way to really stand out is to use these natural focal points to get your brand’s message out. A great example of this is Alteco Super Glue. 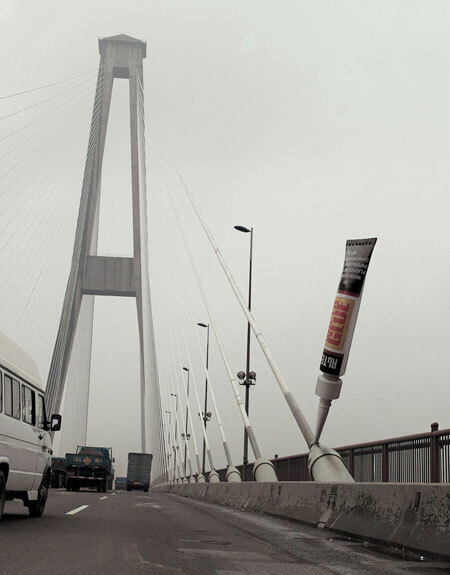 On a large bridge that had 155,000 cars pass over it daily, Alteco attached a large replica of one of its super glue tubes to one of the steel cable supports. This emphasized the strength of the glue, and the display received a lot of positive attention from the local media. The key to doing this right is to ensure that the ad doesn’t offend your potential customers. As a result, it may be wise to avoid landmarks that have significant cultural or local meaning. Going against convention is good. But it’s not enough to be unique; you must always remember to build a relationship with potential customers with every ad you create. This entry was posted on Tuesday, September 17th, 2013 at 3:56 pm	and is filed under Uncategorized. You can follow any responses to this entry through the RSS 2.0 feed. You can leave a response, or trackback from your own site. Does Your Advertising Have a Goal? Does it Make Economic Sense to Buy Locally in This Internet Age?